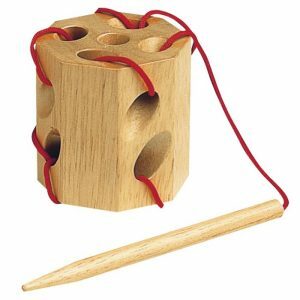 A hand held wooden block with large holes and a long red string attached to a large blunted wooden sewing needle. Encourages a rhythmical and familiar fine motor movement. This sewing block provides opportunities for the restless person living with dementia, to engage in a calming and repetitive familiar fine motor activity.